Ariel Ariel, the heroine of our story, is a little mermaid who longs to be human. Ariel has a beautiful mezzo soprano solo but must be able to convey meaning through gesture once she loses her voice. Prince Eric Prince Eric is the adventurous prince who captures Ariel's heart. Need strong acting. Should also needs to sing and move well. Sebastian Sebastian is the meticulous and anxious crab who tries to keep Ariel safe while getting to lead some of the most memorable songs in the show! A strong singer who can also handle Sebastian's emotional range. Comedic actor/actress. Ursula Ursula is the manipulative sea witch who tries to overthrow King Triton. She is cunning and cartoonishly devious and will stop at nothing to get what she wants. Ursula's songs can be challenging, so look for a singer who will feel comfortable with with a strong belt. Flounder Flounder is Ariel's sincere and sensitive best friend who is loyal to the end. This spunky fish also has a show-stopping solo in "She's in Love." Flounder can be a young actor/actress, or a teen who can play young. Scuttle Scuttle is the know-it-all seagull who serves as Ariel's expert on humans. He is funny and off-beat. Need a performer with good comedic timing and strong vocals who is willing to have fun with Scuttle's eccentricities. King Triton Rules the sea and is a force to be reckoned with. This non-singer needs to command the stage as a strong leader but also show the tenderness of a parent. Mersisters The Mersisters- (Aquata, Andrina, Arista, Atina, Adella, Allana) are Ariel's siblings and full of personality and sass. Each has her own distinct character. Must be able to sing harmonies and move well. The Mersisters will also double as the 6 Princesses in Act II, who are vying for Prince Eric’s hand in marriage. Chef Louis Chef Louis is the over-the-top head chef in the palace. He is always wild and frenetic. This is an excellent featured role for a comedic singer/performer. Exaggerated French accent. Flotsam Flotsam and Jetsam are Ursula's slippery spies. These electric eels are sinister and sneaky. They need to be good movers or dancers and will back-up Ursula with vocal harmonies. Jetsam Flotsam and Jetsam are Ursula's slippery spies. These electric eels are sinister and sneaky. They need to be good movers or dancers and will back-up Ursula with vocal harmonies. Pilot The Pilot is the head sailor on Prince Eric's ship. The Pilot has a few speaking lines, but his singing voice is most important because it opens the show! Grimsby Grimsby is Prince Eric's prim and proper valet. He is rigid in personality and constantly trying to guide Prince Eric towards the throne. While Grimsby does have some singing to do, strong acting trumps singing ability for this role. Carlotta Carlotta is the headmistress in Prince Eric's palace and Ariel's greatest human ally. This non-singing role needs to be warm and maternal to make Ariel feel welcome. Ensemble Sailors, sea creatures, gulls (sing/dance back-up to Scuttle), lagoon animals, chefs (back-up to Chef Louis), Seahorse (announces King Triton). There are numerous featured vocal/dance opportunities in the ensemble. There will be good challenges for trained dancers as well as those new to the stage. In a magical kingdom fathoms below, the beautiful young mermaid Ariel longs to leave her ocean home to live in the world above. But first, she'll have to defy her father King Triton, make a deal with the evil sea witch Ursula, and convince Prince Eric that she’s the girl with the enchanting voice. 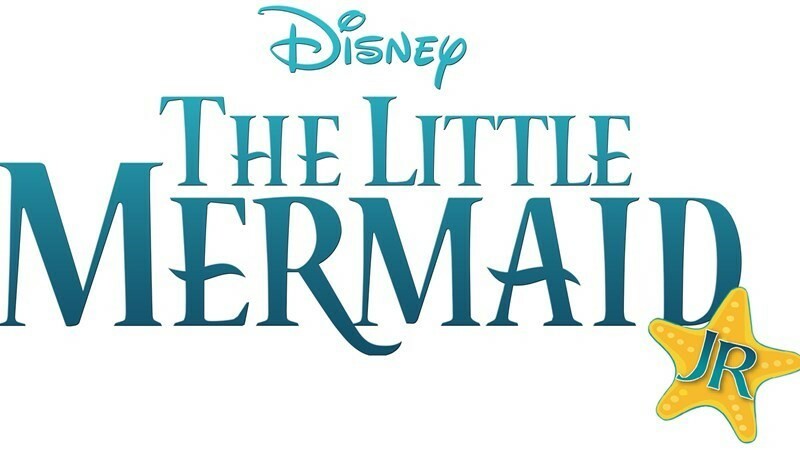 Adapted from Disney’s 2008 Broadway production, Disney's THE LITTLE MERMAID JR. features the hit songs "Part of Your World," "She’s in Love," and the Oscar-winning "Under the Sea." Based on the Hans Christian Andersen Story, and the Disney Film, produced by Howard Ashman & John Musker, and written & directed by John Musker and Ron Clements.